Emicro One scooter review: Keeping up with the kids? As we push off once again, the motor kicks into action and zoom through the English countryside without a care in the world. We effortlessly pass a man walking his dog. The two young children who have accompanied us on this adventure are doing everything they can to keep up. It's clear they are getting annoyed by the lack of effort dad is putting in, but hey, that's a "them" problem, not an "us" problem. We can't blame them, they might be on micro scooters, feet hammering floor hell for leather, but we're on the Emicro One scooter - an electric-motor adult take on the child's accessory that virtually every family takes to the park these days. Looking like a regular kid's scooter, only considerably more black and beefier, the Emicro One Scooter is a heavy beast (certainly compared to the regular scooters you carry when your children get bored), weighing in at 7.5kg. 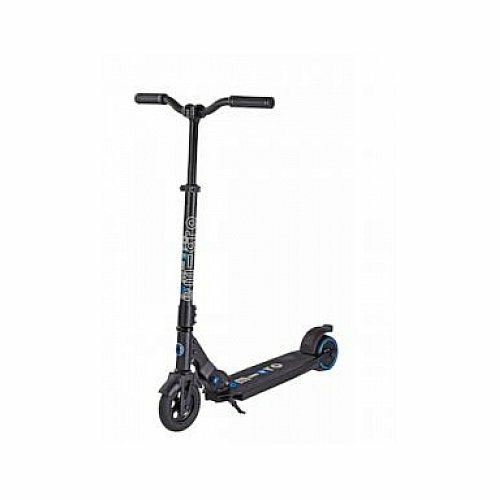 Like the kids models the company sells, this scooter is capable of folding in half when you need to pack it away, and the main upright poll that delivers the handle bars is adjustable to suit a variety of different heights. The main difference in design compared to the kids model, though, is that there is a much bigger and much wider foot-plate, presumably to cope with your grown-up-sized shoes. It certainly works: we were able to put both our feet on the board at the same time and enjoy the world as we zipped along. To brake, you simple press the rear mud flap down against the wheel. This flap doubles as a regenerative brake to charge the battery. Clever. Importantly there is no throttle to squeeze or twist, no real evidence that it is an electric scooter, and no complicated combination of buttons to learn. The only real giveaway is four LED lights on the foot-plate to tell you how much charge you've got left. And, of course, the fact it's so heavy. If you are under the assumption that you'll be able to jump on the Emicro One and whizz off to work with zero effort from you, then don't. The best way to describe the electric element here is as an assist to your journey, not one that fully powers it. You will still have to "scoot", you will still have to be involved in kicking off to get moving, and it is only once you've got some motion that the electric motor kicks in to help you. That said, you shouldn't underestimate how much assistance this scooter is willing to give. As we've said we could easily "keep up" with the kids on their scooters with very little effort. A bit like modern cars the One has three performance programmes to choose from: eco, standard and sport. Each limits the maximum speed of the support and the maximum power of the motor. Go eco and you won't be able to go as fast, but you do get more distance before the battery dies. Not that distance is a major problem, as the emicro one has a range of around 12km on a single charge, something we had no problem achieving over a couple of days without plugging in. Even if you do have to charge it, you're back up and running within 60-minutes of plugging it into the wall. If an hour is too long to wait, or you're miles away from a changing point, it doesn't entirely matter. This is still a scooter through and through, and so still works as a scooter whether you opt to use the electric motor element or not. Our very first use was without the battery as, rather embarrassingly, it turns out you can deactivate the motor element by tapping the brake lever three times in succession. It was only when we spoke to Micro Scooters to see whether we were doing something wrong, that they informed us that we were. Opps. When the motor is going, although it is never overly fast, we found that it still goes fast enough that without focus, especially when stopping, you can certainly feel like the scooter is running away from you. The gut reaction is to giggle and then jump off as quick as you can, but we suspect with time you'll get to learn that feeling. Well, hopefully. Giggles aside you quickly learn to control the speed, although expect to get plenty of looks as you hurtle past. Kids on scooters is an expected everyday occurrence, an adult on one turns heads. There's a catch, there's always a catch, and in the case of the Emicro One scooter it's the price. Forget about the over-heavy 7.5kg of weight for a moment and contemplate the eye-watering £750 price tag. Yes, for a scooter. It is not that we can't see where the money goes though: built like a tank, the Emicro One is clearly happy to take a beating, plus it works a treat zipping you along at comfortable speed. Just that £750 could buy you an old banger, or get you a lot of taxi rides - or simply buy you 10 non-motorised scooters that will help you actually do some exercise at the same time. It's a shame, because we like the Emicro One, as do our kids and anyone who's tried it out, smile beaming across their faces. But as as soon as we mentioned the price, that smile turned to laughter - the kind that couldn't fathom how anyone could justify spending that much on a scooter.